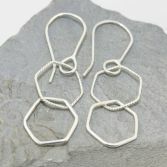 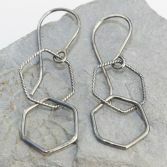 These pretty yet simple Twisted Hexagon Dangle earrings are made of solid sterling silver wires 0.8mm and 1mm thick wires. 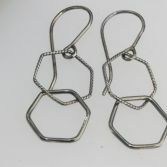 The Twisted Hexagon Dangles have been hammered into a hexagon shape and then soldered to link together and to hang from our handmade sterling silver ear wires made from solid sterling silver, the loop of the ear wires has been soldered together to ensure the Twisted Hexagon Dangles do not fall off. 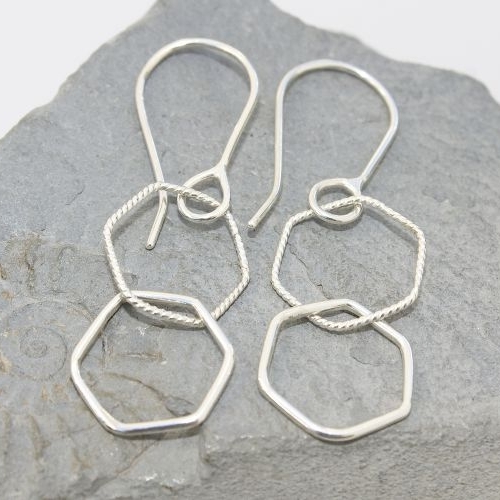 Your Twisted Hexagon Dangles will be presented in a gift bag bubble wrapped and place in a bubble envelope and will be posted via Royal Mail 1st class recorded delivery (signed for) to any UK address free of charge.